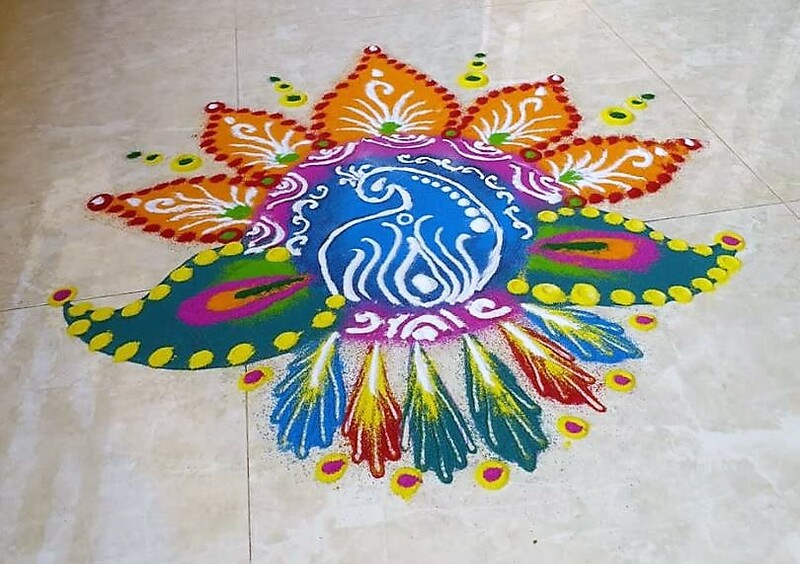 Check out these amazing rangoli designs 2018. They are simple, colorful and super easy to create. All you need to make these beautiful rangoli designs is a bit of artistry, some rangoli powder and a perfect occasion. 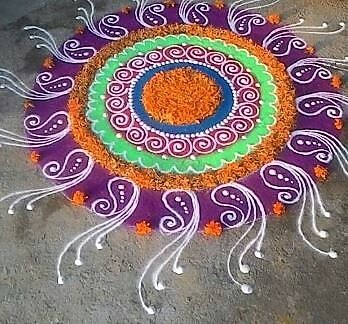 Here is a very beautifully done rangoli. Make a square in the center and fill it with red color and make criss-cross lines on it. Add floral and leafy pattern on the sides. 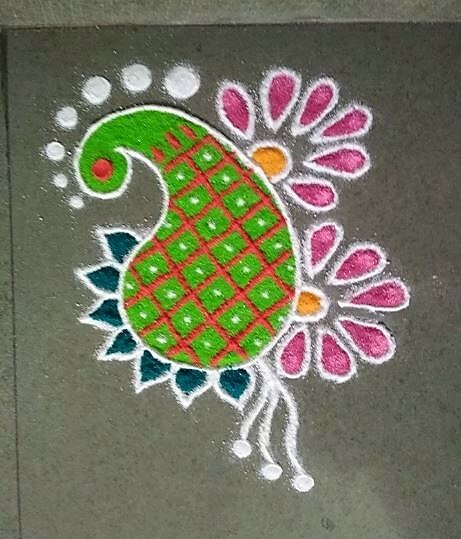 This rangoli is quite simple. 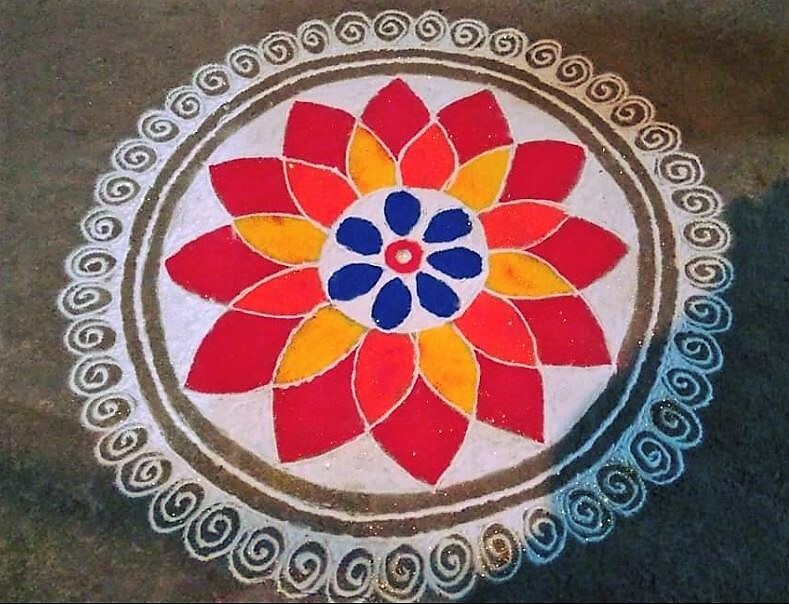 Just make a huge blue circle and add rangoli patterns on it. Draw a flower in the center with the help of your finger. 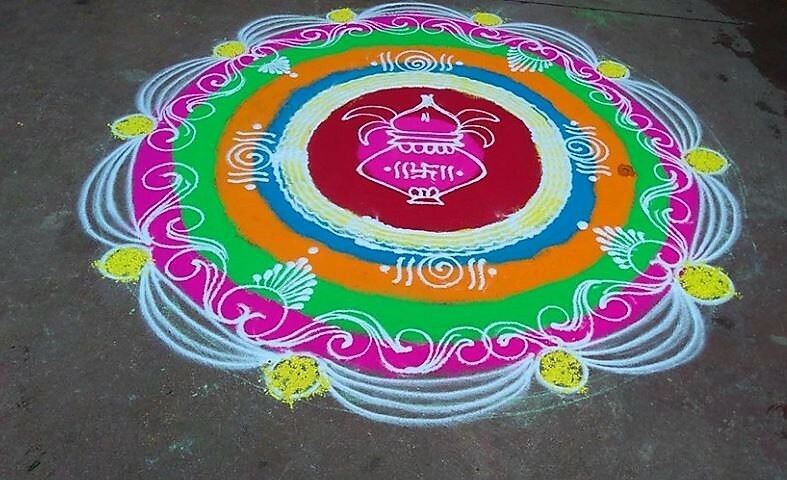 A colorful rangoli can lift up your spirit during festivals. They help fill up your home and life with happiness and celebration. 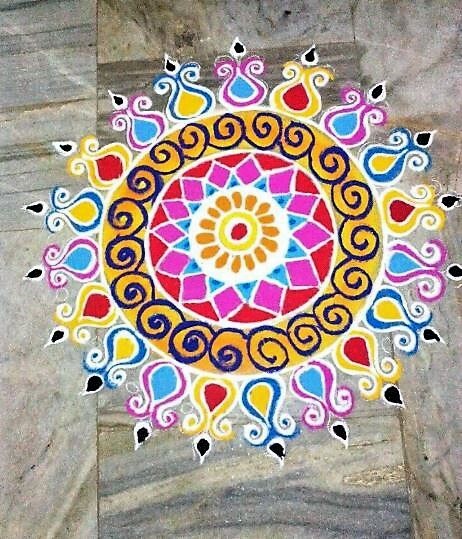 Check out this vibrant free hand rangoli. You need bright yellow, orange, red, blue, pink, white and black rangoli powder to draw this one. Make a colorful base and draw Sanskar Bharti patterns over it. 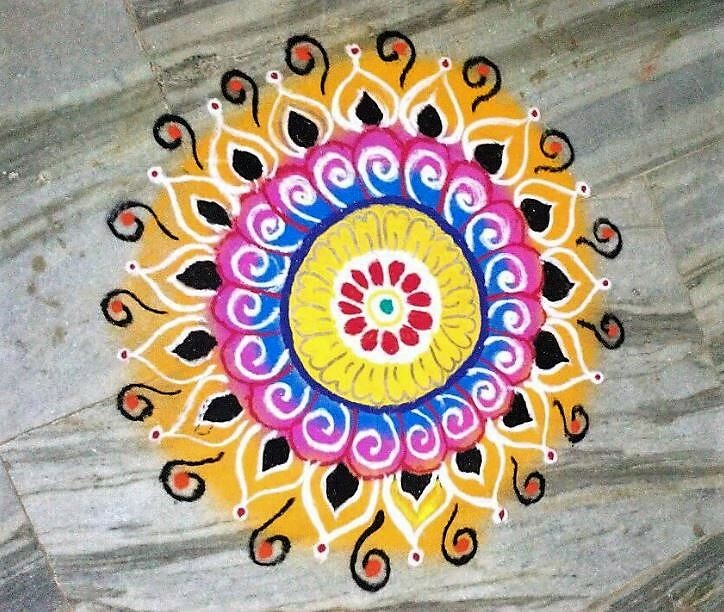 You can easily create this rangoli along the wall of your pooja room or living room. 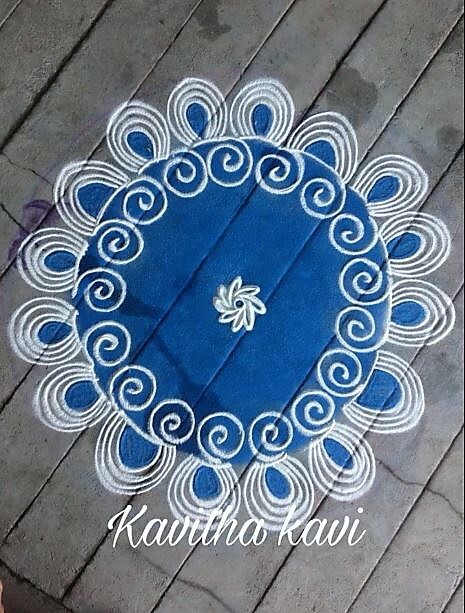 This rangoli design is made with the help of toothpick. Pour the required rangoli powder and use a toothpick or your finger to make patterns. Beauty in simplicity! Well this the thought that crosses my mind on seeing this small parsley rangoli. 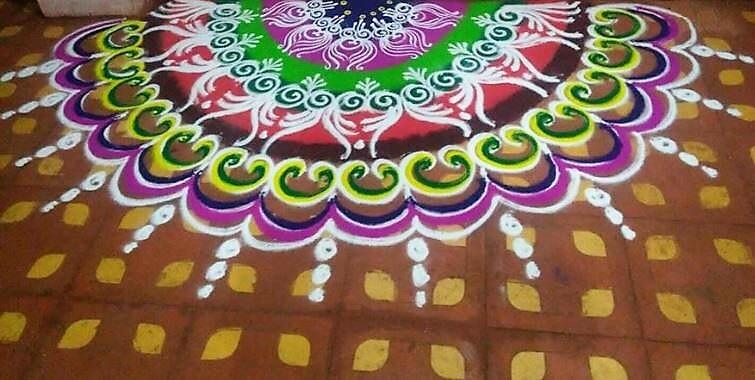 These are some of the best rangoli designs 2018. 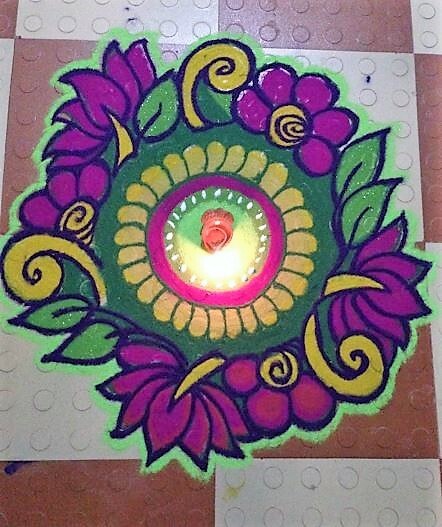 Here is a unique rangoli with a 3D effect. 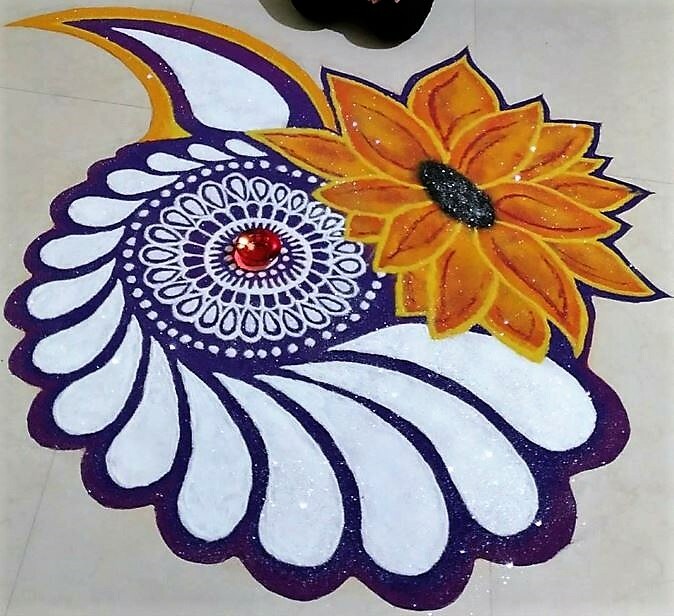 Add a diya in the center of the rangoli design. 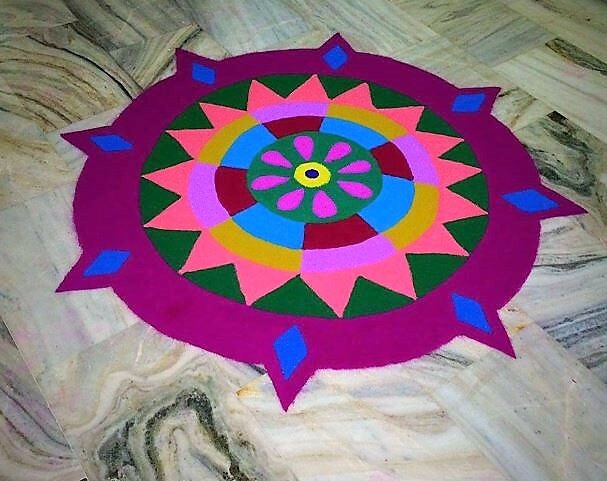 This is an easy rangoli design apt for beginners and kids to make. 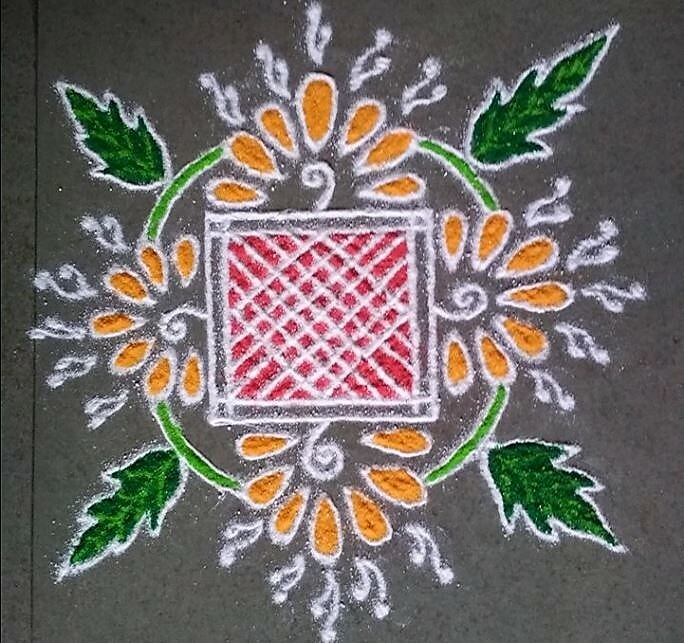 Draw the pattern on the floor with a chalk and fill it with rangoli powder in myriad colors. 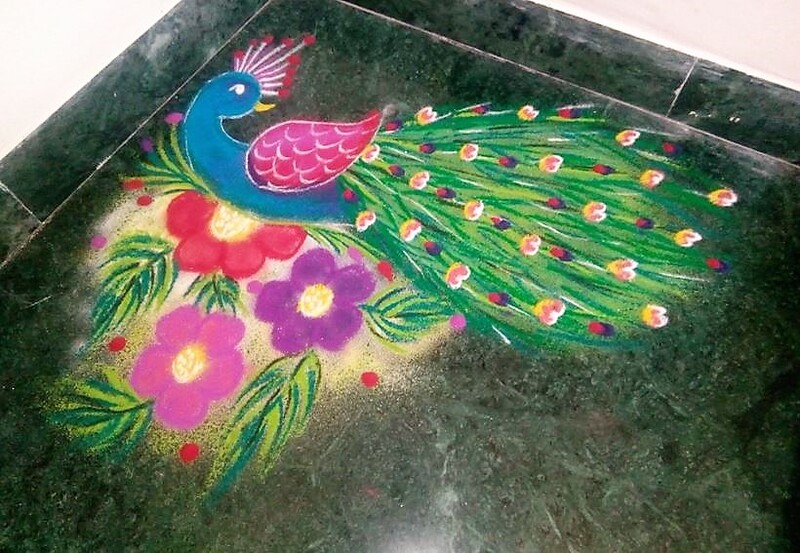 Decorate your living room by drawing a peacock rangoli in one corner. I love the detailing on the feather of this magnificent bird. Make a mix of rangoli colors and flower petals and create a rangoli of your own. Make colorful rings to create a similar rangoli. 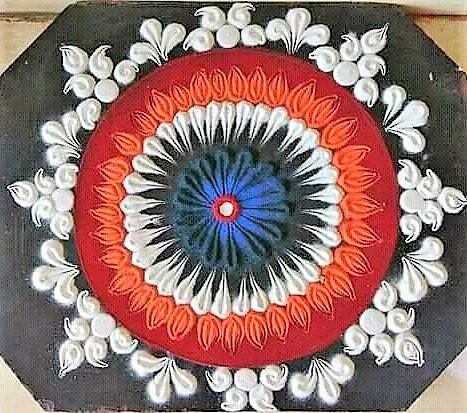 Draw a Mangal Kalash in the center and Sanskar Bharti patterns around it. Get your creative side out and try to mix different patterns. Pick bold colors to create an impact. Go for thick white outline to make it stand out. 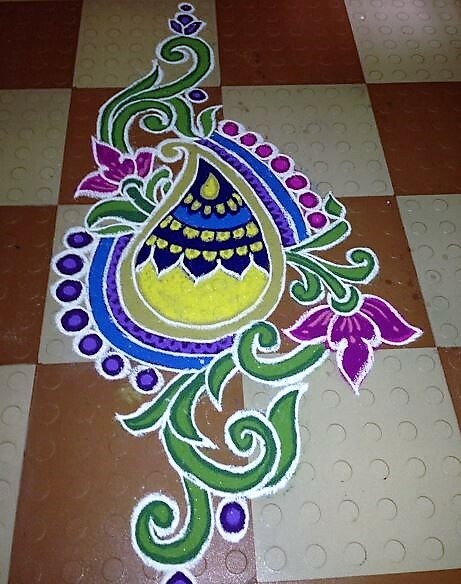 Use purple, green and yellow rangoli color to make a gorgeous design. Make a circle in the center; place a diya on it. Surround it with floral and leafy patterns. 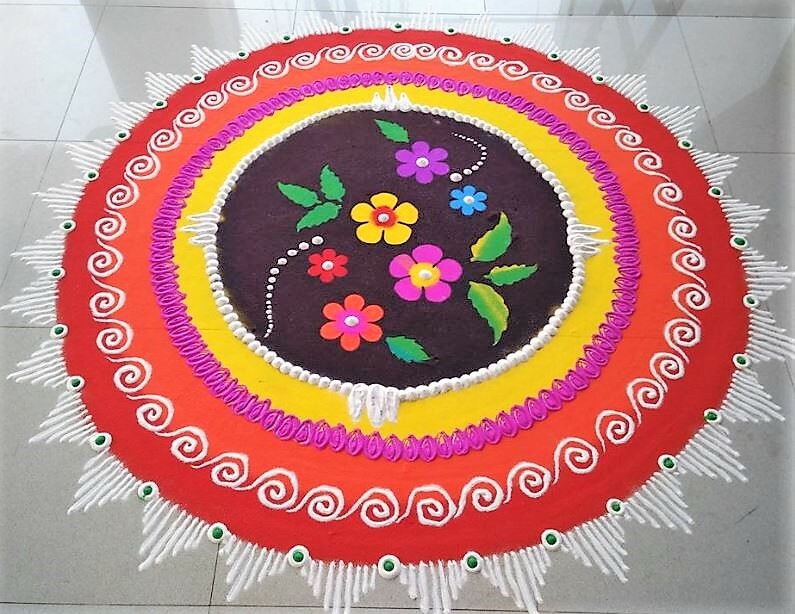 You can use just two colors to get stunning rangoli designs 2018. The artist has used white to create the outline and then fill green color in it. 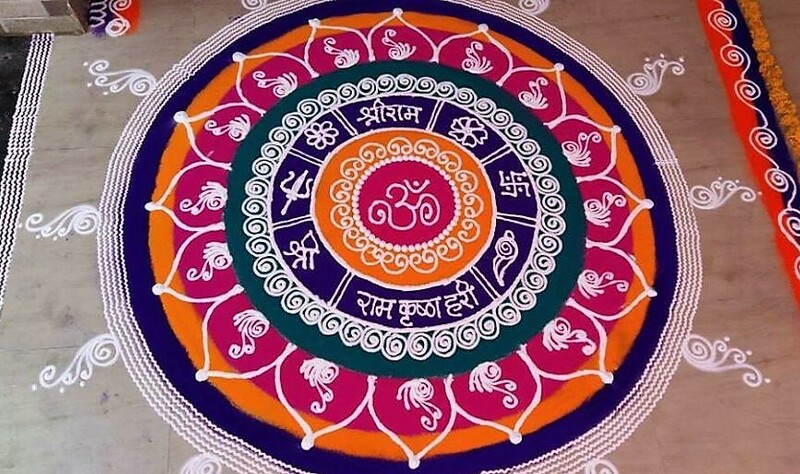 Decorate your pooja room with a nice Sanskar Bharti rangoli. Make an ‘OM’ in the center. Use orange and blue color to create a beautiful border. 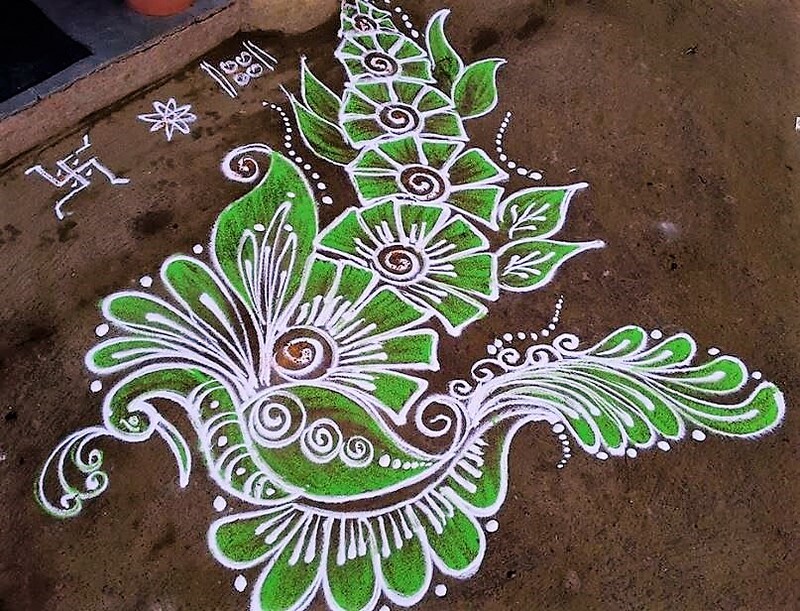 Here is a cool rangoli with some amazing design. You can make this in any corner of your house. Make a blue circle and add a Lotus flower on it. Add a couple more rings around it and some interesting patterns on it. 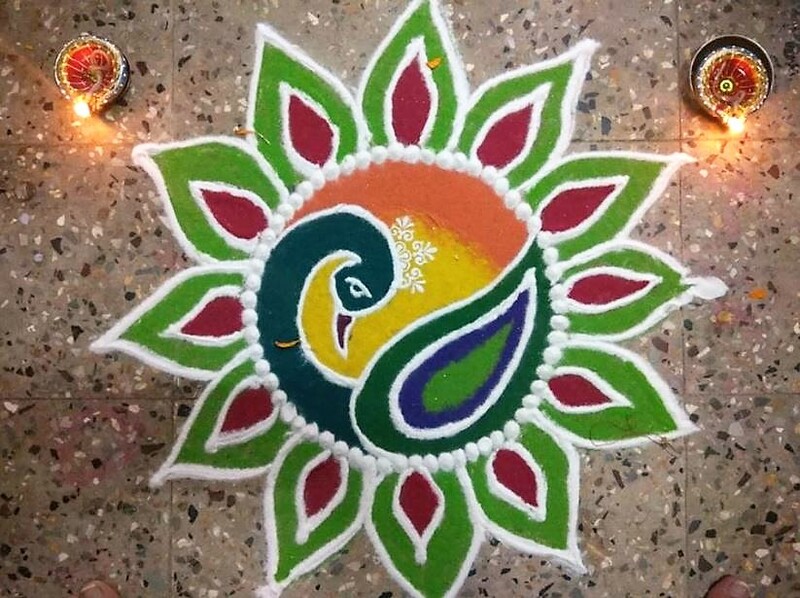 Go for a peacock rangoli; these rangoli designs 2018 are very popular. This one looks very elegant and has a neat design. Add a few flowers in the middle to create this impeccable look. 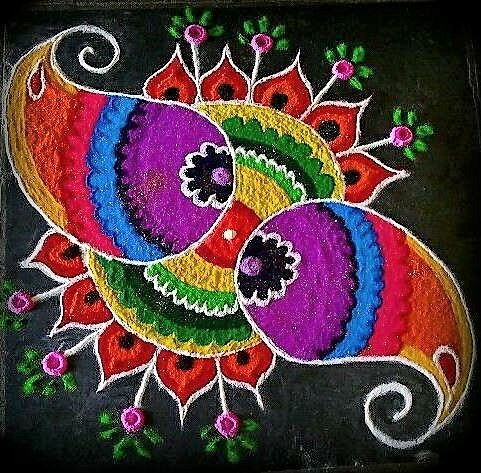 Make a colorful rangoli at your doorstep to ring the festive season. It is simple and easy to draw, use your fingers and toothpick where ever required. I love this Ganpati rangoli design. 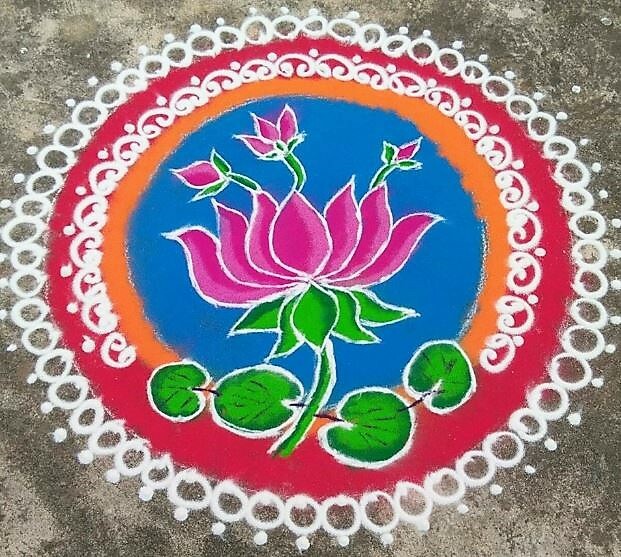 This is a perfect rangoli for Diwali, Dussehra, Ganpati, Holi and other Indian festivals. 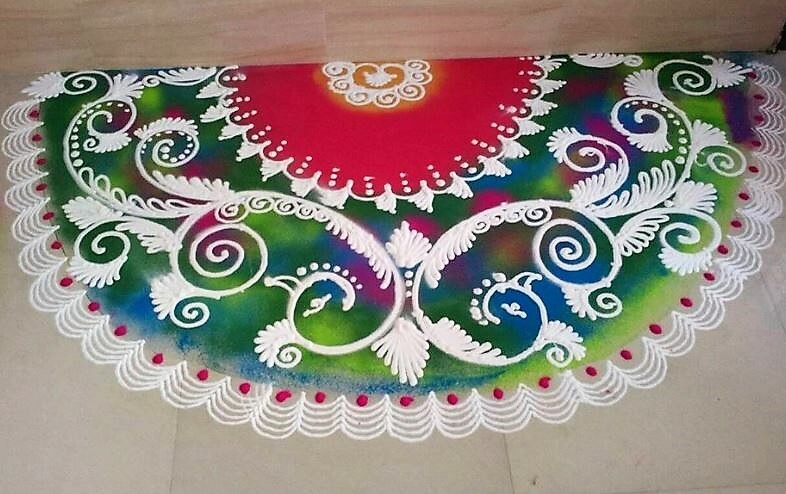 This bright colorful rangoli is perfect to mark a special occasion. The vibrant hues of this rangoli design lift up your and make you feel happy. Go for a traditional round floral rangoli. Make this amazing rangoli at your doorstep or courtyard to welcome happiness and prosperity into your house. 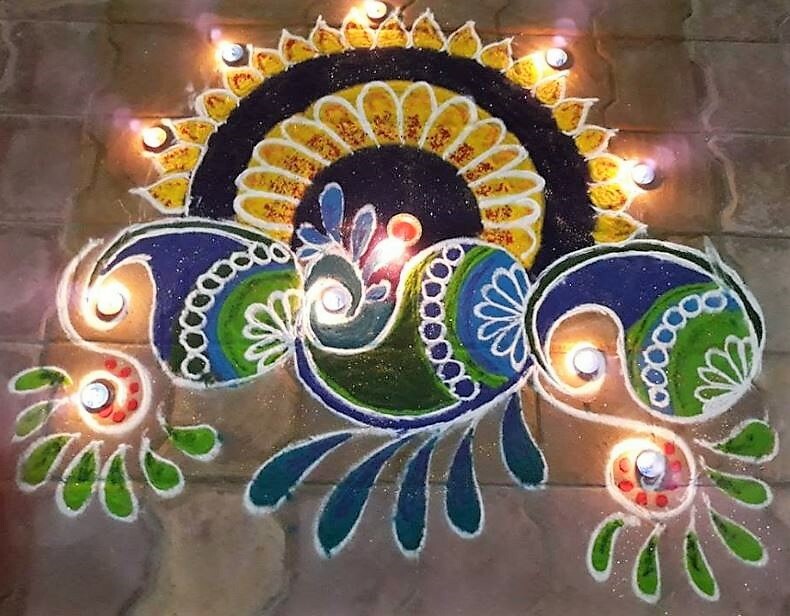 Use diyas to enhance the look of your rangoli design 2018. You can even opt for tealights to brighten up your home during festivals. 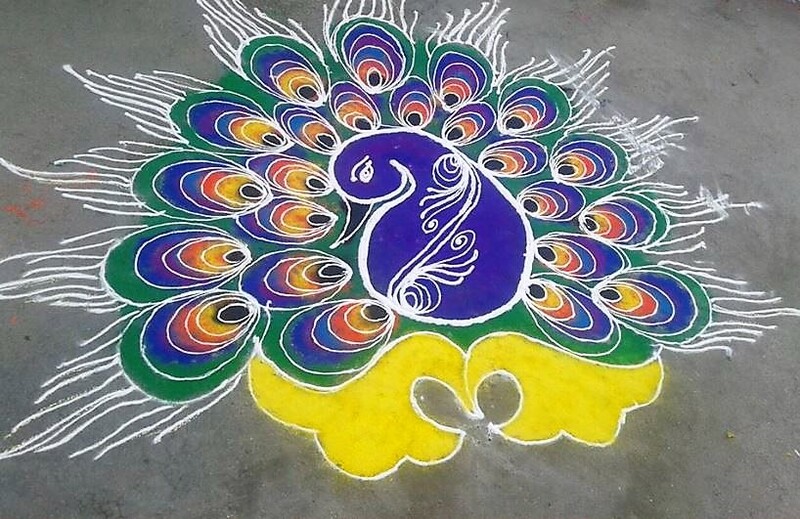 Check out this mesmerizing peacock rangoli design. Make a circle and draw peacock on it. Surround it with floral petals in green and red color. 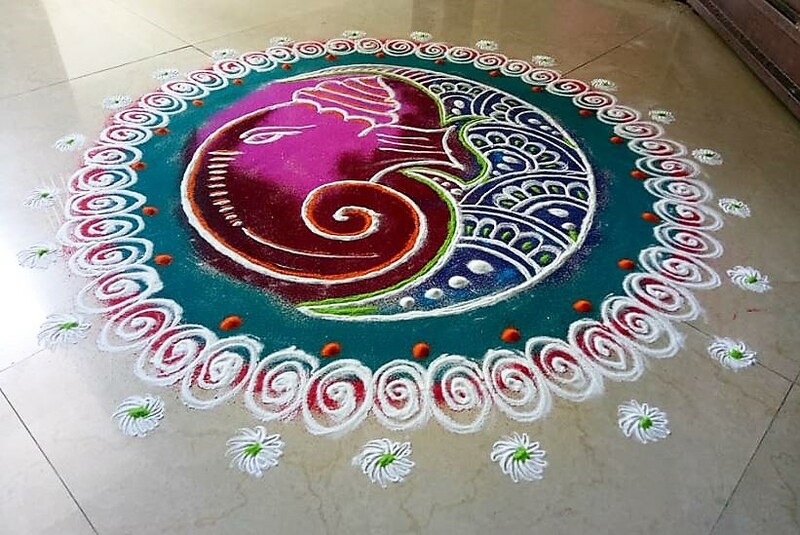 This entry was posted in Decor, Rangoli Designs and tagged Best Rangoli Designs for 2018, Colorful Rangoli Designs, Diwali Rangoli Designs, Easy Diwali Rangoli Designs, Ganpati Rangoli Designs, Indian Rangoli Designs, Latest Rangoli Designs, Peacock Rangoli Designs, Rangoli, Rangoli Art Designs, Rangoli Design, Rangoli Design 2018, Rangoli Designs, Rangoli Designs 2018, Simple Diwali Rangoli Designs by Homemakeover. Bookmark the permalink.